My friend Meri contacted me a few months ago to let me know that she had ordered a special cutter to be sent directly to my house. 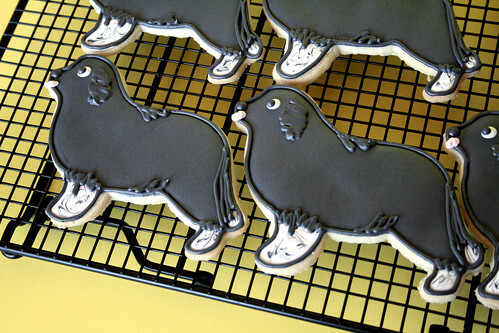 She wanted me to make cookies resembling her big puppy, Darwin – a Newfoundland. The cookie cutter was very large, and I was a bit concerned about the folks later eating all that black icing… (imagine their tongues & teeth?! ), but I went ahead with the design. Her doggy has just a bit of speckled white on his paws, and I incorporated that with a tiny amount of marbling. The rest is all black, baby! From his body to his tufts of back fur, to his long, bushy tail – BLACK! I loved his big, shaggy ears. 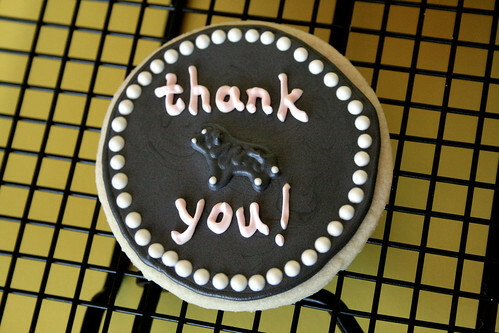 And, as always, I created a special Thank-You cookie just for Meri. This one was extra fun, piping a tiny, little Darwin on the cookie. I just used little white dots to represent his speckled feet, as there wasn’t room for more detail! 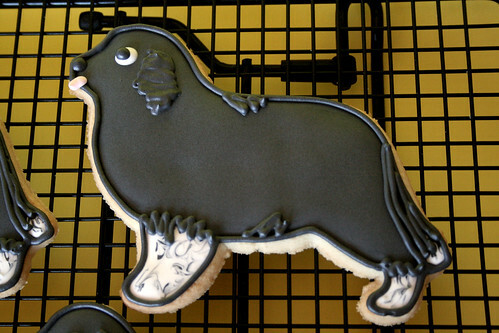 With the box of cookies, I included a special surprise for Darwin himself – a large box of Newf Breakfast Bars. The batter for those “cookies” used my very largest mixing bowl… and then some! (Be warned, though – these will NOT make a good dough for cutting out shapes, as I tried desperately.) I was surprised as I mixed them up, though – the batter/ingredients smelled more like “people food” to me! So adorable!! I have a yellow lab, and I ordered a cookie cutter so she could make Christmas cookies for her people friends this year. As I was making them, though, I was thinking that it was good I don’t have a black lab. That black icing turned out perfectly… Your cookies are perfect! Thank you! They took a LOT of color, and my friend sent me pics of her daughters with black tongues, but they all still seemed to really enjoy the cookies! My favorite part about this is that she ordered a cutter TO BE SENT DIRECTLY TO YOUR HOUSE. I love it!! And the little dog is adorable as well. I love the little tongue. And I didn’t even know she wanted them until AFTER she had ordered the cutter already! It was a fun order! 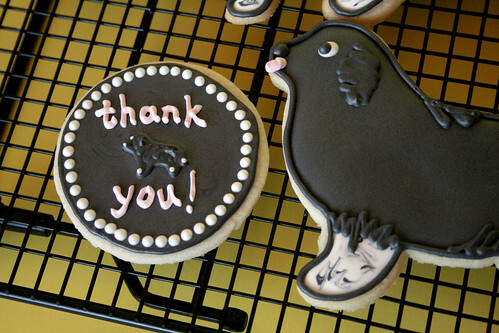 I love all of your attention to detail here – from the paws on the big guy to your tiny replica on the round cookie. Great stuff!